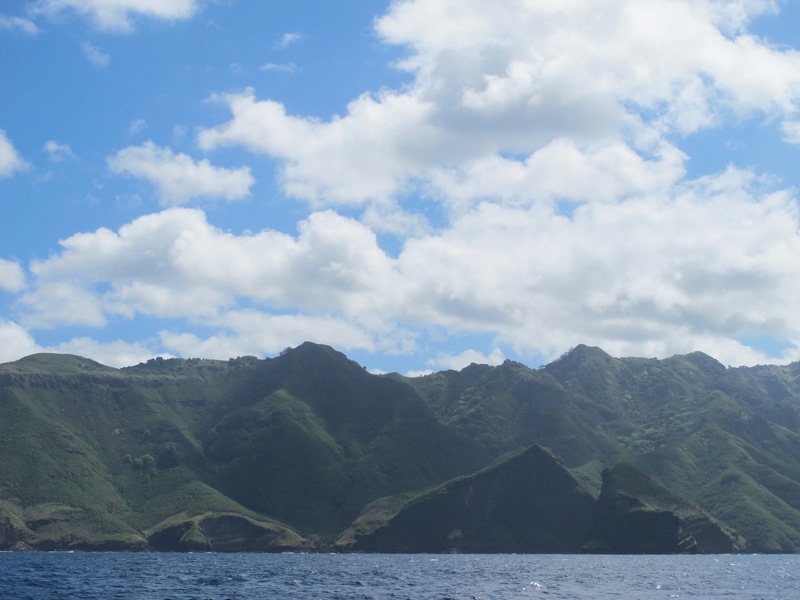 We left Nuku Hiva on the afternoon of 21st June after the big seas and swell had abated, hoping for a good beam reach to the Tuamotus 470NM away. The wind was a perfect 15-17 kts and we sped out of the anchorage with full sails up, carving a beautiful straight course to our destination, Tahanea. Ah, finally some champagne sailing! The rest of the afternoon was glorious, the stuff that dreams are made of. 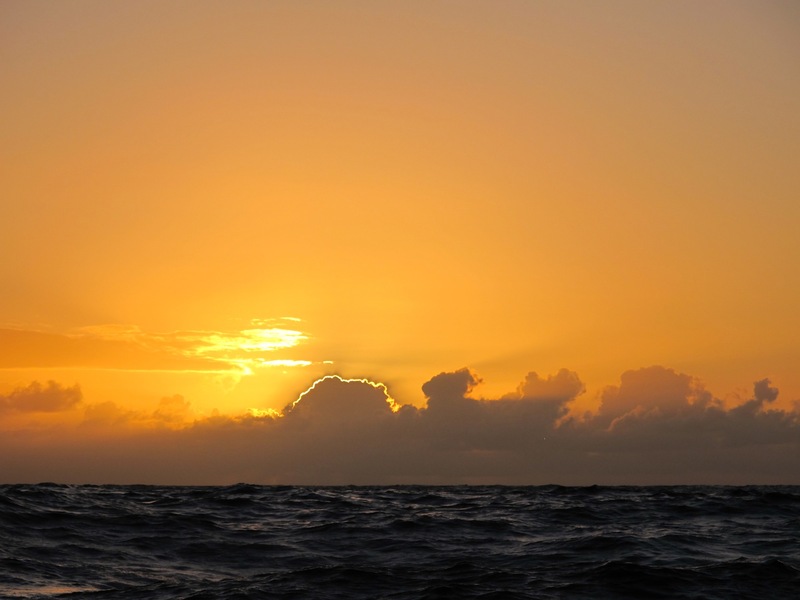 Of course it was too good to last, and by nightfall we had reefs in the sails with gusts of 25kts and a confused and lumpy swell hitting us on the beam. Here we go again! 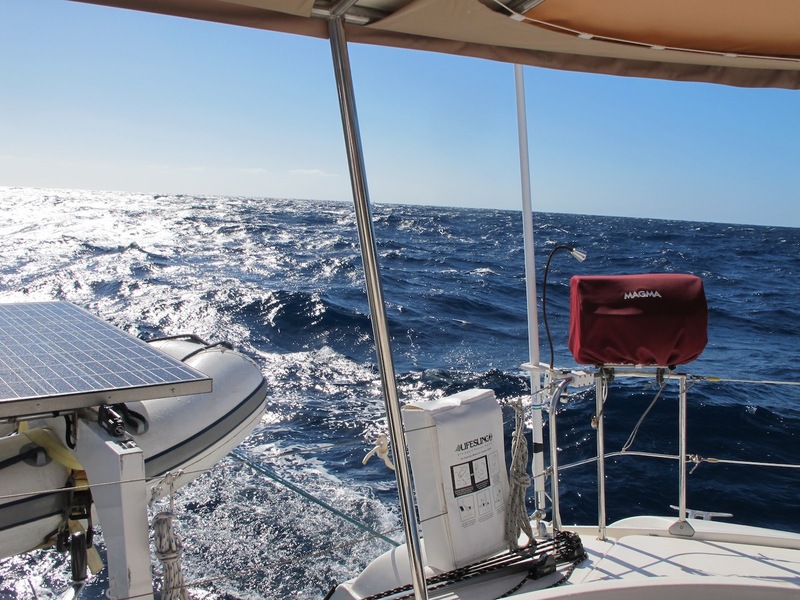 Gradually over the course of the next day and night the wind veered round to the north, pushing us more east as we tried to maintain a decent sailing angle – cats struggle going dead downwind and we’re no exception. 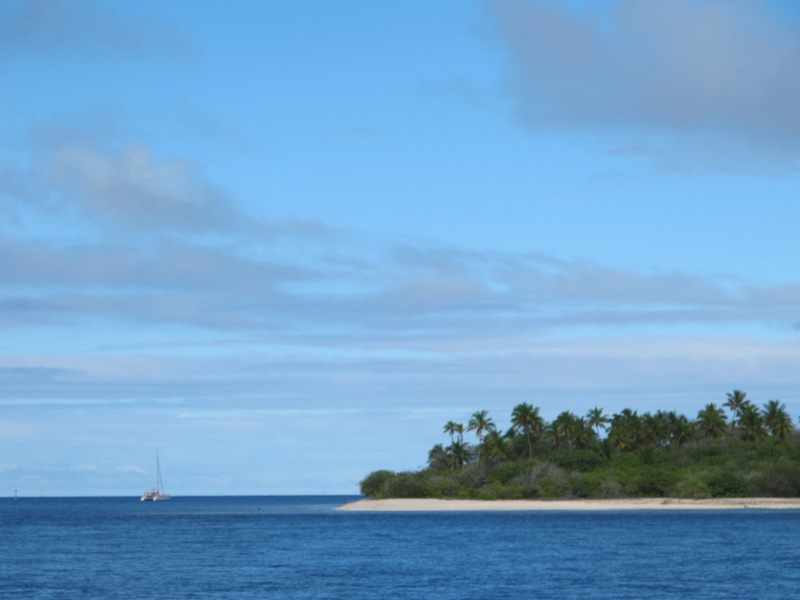 We were sailing in company with Rehua, and after much discussion on the VHF we decided to stop fighting Mother Nature and instead alter course to one of the more eastward atolls, Raroia. Even so, we had to time our arrival at the pass in Raroia at slack low tide so we reduced more sail to slow down. 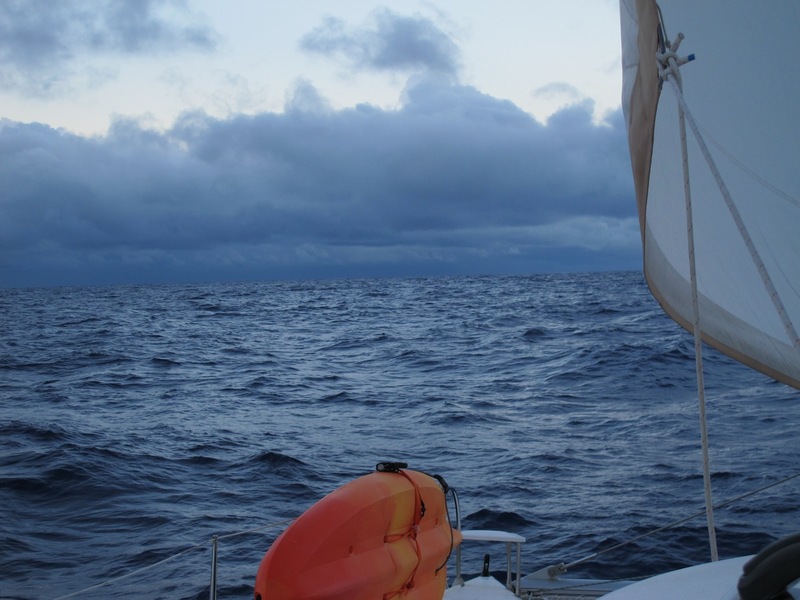 By now it was our second night at sea and we were nearing the atolls, with increasing clouds and some squalls starting to come through. Oh, how I wish we’d been able to get a radar fitted – without it we have no clue what’s about to thump us at night. Luckily for us Rehua have radar and Sean was able to give us a heads-up about a wall of moisture heading our way during the night. We dropped the main and had just a smidgeon of jib out. Bruce went off-watch and I pulled on my wet weather jacket and settled in for a dreary, drizzly 3 –hour watch. Did I mention that we have very little protection in our cockpit except for the bimini overhead? No nice cosy clears like we had on Illusion, keeping us snug and dry in the worst of the weather. Well, at 4am (why, oh why is it always in the wee small hours of the morning???) an avalanche of water and wind hit us as the front passed overhead. In seconds the wind had swung from N to SW, the jib had backed, the autopilot had gone off, the ipad (even in it’s waterproof case) couldn’t cope and was having heart failure. And I couldn’t see the hand in front of my face let alone the instruments. It felt like all hell had broken loose, and there was Bruce snoring contentedly down below! I was simultaneously trying to get the ipad into the cabin, wipe my glasses, get us back on course, meanwhile yelling over the wind and rain trying to wake my oblivious skipper. Poor bloke, it’s not a nice way to come out of a deep sleep with a crazy dripping wet banshee screaming at you! Up he jumps in just his jocks, races out into the maelstrom to help me furl the jib and get us back on course. Two drowned rats in the middle of the night. Getting clears fitted is now a priority let me tell you!! Luckily the worst of it only lasted about half an hour and then the wind and rain eased, we dried off and jogged our way closer to Raroia, eventually arriving at the pass around 8.30am. How nice to see palm trees and crystal clear water after the mayhem of the night before! The conditions were perfect for getting in through the pass so we had a very easy, calm entry. The pass itself is quite wide, with channel markers to make it even easier. We motored down the channel in flat water (joy oh joy!) and dropped anchor near the village in turquoise water. This looks like our kind of place! Glad to hear you have found the Tuomotos living up to expectations. Also reassuring that Mother Nature is being consistent in her inconsistency. Enjoy!